Audiences could be forgiven for their slack jaws when venerated thesp Liam Neeson blazed onto screens as the hard-as-nails lead in EuropaCorp’s dark and deliciously brutal genre flick, Taken, back in 2008. Since then, the actor has gone on to define not only his own brand of throwback action antihero, but a personal cult sub-genre affectionately dubbed ‘Neesploitation’. 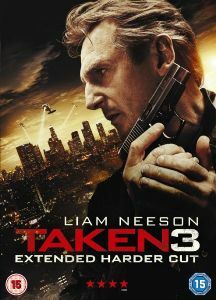 Alas, the series that originally launched this unexpected career reinvention has struggled to maintain its star’s giddy momentum and if the ludicrously overblown Taken 2 was flirtatiously eyeing the shark, then Olivier Megaton’s Taken 3 (2014) has not just jumped it, but landed on the other side with a combat roll. In fact, compared the to the homogeneous rubbish that constitutes the franchise’s third offering, the last one was a glorious triumph. It may beggar belief, but audiences will be longing for the ridiculous hand-grenade location triangulating antics of the previous film as they yawn through this turgid threequel. Where Taken 2 sought to at least continue the narrative of the first film, it has now been jettisoned in favour of beige thriller plotting that really could have been headlined by any action front-man with a hand canon and armoured with any manner of generic title. Worse still, the sanitation of the initial film’s gritty, violent charisma – which began in the first sequel – has now been completed. There is scarcely a single action beat in Taken 3 that will appeal to the exploitation fans that enjoyed the visceral thrills of the original – ridiculous – conceit. Some things do remain, however. The film opens with the traditionally clunky family dynamic drama that Neeson, Famke Jansen and Maggie Grace seem to make even less convincing than before. Rather than a kidnapping, it is then a murder that sends Bryan Mills (Neeson) back into action as he goes on the run Fugitive-style. Except that this is more like US Marshalls. Neeson has grown ever creakier since his first foray into the genre and Megaton has to cut and run at a furious pace to disguise his leading man’s lumbering frame. It conveyed a powerful threat in the first Taken, but there’s little of that left now. That the general quality of the dialogue and storytelling make Neeson look sprightly is no understatement. Forest Whittaker turns up as the LAPD’s Franck Dotzler, whose penchant for toying with elastic bands is exasperatingly annoying until you realise that it is at least inspiring some form of response and distracting you from the plot holes that Mills is escaping through. If the upcoming machinations aren’t evident from the outset – and it should be stated for the record that they’re signposted in neon – it matters little as interest has waned a long time before any obvious revelations. It has been said that Taken 3 is the final chapter in this series which is both a relief and shame. Fortunately, we won’t have to sit through another rehash of this tangentially connected bilge. It’s just unfortunate that it ever sunk quite so low.